Hugo Wallace Weaving was born on April 4, 1960 in Nigeria. The middle sibling of three, Hugo has an older brother Simon and a younger sister Anna who both also currently live and work in Australia. During his early childhood, the Weaving family spent most of their time traveling between Nigeria, Great Britain, and Australia. This was due to the cross-country demands of his father's job in the computer industry. Later, during his teens, Hugo spent three years in England in the seventies attending Queen Elizabeth's Hospital School in Bristol. There, he showed early promise in theater productions and also excelled at history, achieving an A in his O-level exanmination. He arrived permanently in Australia in 1976 and finished his education at Knox Grammar School, Sydney. He graduated from NIDA (National Institute of Dramatic Art), a college well-known for other alumni such as Mel Gibson and Geoffrey Rush, in 1981. Since then, Hugo has had a steadily successful career in the film, television, and theater industries. However, Mr. Weaving has illustrated that, as renowned as he is known for his film work, he feels most at home on stage and continually performs in Australian theater productions, usually with the Sydney Theater Company. With his success has also come extensive recognition. Hugo has won numerous awards, including two Australian Film Institute Awards (AFI) for Best Actor in a Leading Role and three total nominations. The AFI is the Australian equivolent of an Academy Award, and Hugo won for his performances in Proof (1991) and The Interview (1998). He was also nominated for his performance in The Adventures of Priscilla, Queen of the Desert (1994). 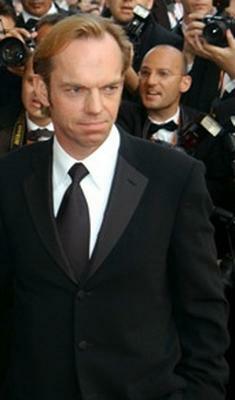 Hugo garnered the Best Acting prize for The Interview at the Montreal Film Festival in 1998 in addition to his AFI Award and, that same year, won the Australian Star of the Year. More recently, roles in films such as The Matrix trilogy as Agent Smith and The Lord of the Rings trilogy as Lord Elrond have considerably raised his international profile. His famous and irreplacable role in The Matrix movies have made him one of the greatest sci-fi villans of the Twenty-first Century. With each new film, television, or theatrical role, Hugo continues to surpass his audience's expectations and remains one of the most versatile performers working today. Hugo resides in Australia with his wife, Katrina Greenwood (an artist whom he wed in 1984), and their two children, Harry and Holly. Childhood Fact: Born in Nigeria to British parents, he spent his childhood in South Africa, England, and Australia. Medical Fact: An epileptic, he's been on medication since his first seizure at age 13.